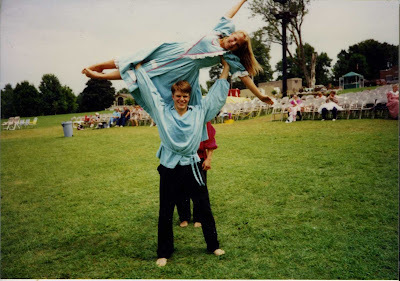 This time of year always brings my mind to the City of Joseph Pageant that was performed in Nauvoo for many, many years. I made so many friends there, gained a testimony of Christ there, and met my husband there. Guess I have good reason to love the place. 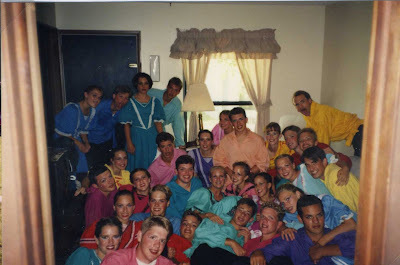 :) We would go down to Nauvoo, IL and learn the dances and everything in less than a week, then perform for the next week. Let me also reminise over the weather in August in Nauvoo, hot, muggy, hot, hot and humid. I always stayed at what is now the Joseph Smith Academy. No air conditioning either. Cold showers and industrial fans were my friends. Just before "rolling down" for the second half of the pose. This one always caused bruises. 1996 The pyramids were always spectacular! Don't bother looking for Benson, he is surely in the back ready to catch the girls at the top, he had a reputation for never dropping a girl. 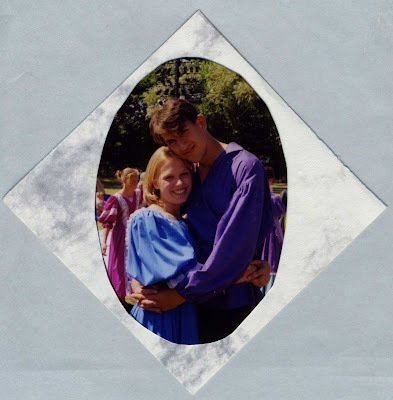 1996 But I sort of had a crush on this other guy. :) (can you find us?) We always had to sqeeze a large number of us into a small place to get our makeup done. It was a great time to bond. 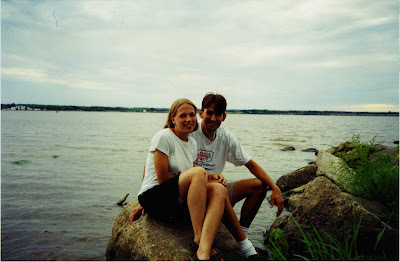 1997 Sealed the deal for us. We got married a year later. 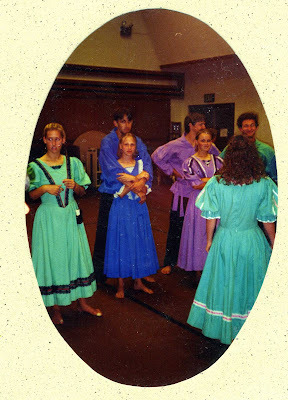 In 1999, we went back to perform in the pageant. Even though there is a 1 foot height difference, we got to dance as partners. 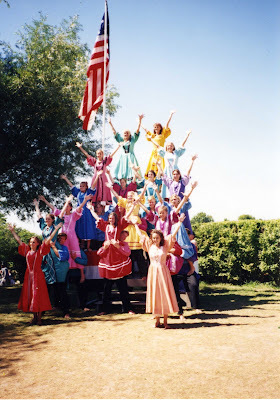 We always thought we would go back someday to perform in the pageant with our own family, but 2004 was announced to be the last year of the City of Joseph Pageant. I understand there is a new "Nauvoo" pageant, but I will always remember the City of Joseph, and miss it this time of the year when we performed. wow, wow, wow. those pictures are priceless. you all look so little and cute! haha. good times. 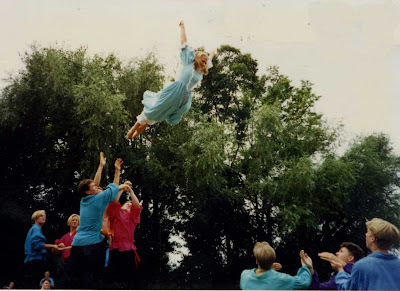 What great memories..But let me say, the way you were flying in the air would have scared the heck out of me..whew! That so funny! I never knew that that is how you two met. Too cute! I can't get over how long ago that was. I remember when you two got to go back and dance again after you were married. Whenever I think of the City of Joseph, I think of you dancing away. how great are those. what fun memories! Oh, Cheryl, the good old days! I get so nastalgic the beginning of August every year! The smell of the grass, the smell of the sweaty guys, the smell of all of us! I too wanted to at least take my own family back to be in the show and I am so sad that will never happen. At least this year we will be adding something new to be excited about in August. And there is no way I would have been on that hill in the heat and humidity being 9 months pregnant like this year! What a great story!! It's so fun to know how couples met! ANd I can't believe you let them throw you like that- now THAT is Faith!!! What great pictures to remember such a fun time in your life! I recognize Denise in one of the pictures too! Love memory lane! Did you know the academy is no longer there? I just found out. How sad. Are they improved or just different? My newest hat, computer graphics guru. And it begins... school that is. If you say it enough, people will believe.